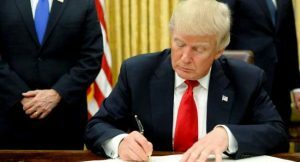 28 January 2017 – President Donald Trump on Friday signed an executive order putting a four-month hold on refugees flow into the United States. This temporarily bars visitors from Syrian and six other Muslim majority countries Iran, Libya, Somalia, Sudan Iraq and Yemen. According to the White House, the new measure which will last for 90 days is expected to keep radical terrorists out of the United States of America. But civil rights groups say the move is discriminatory and will paint the United States in bad light. “I’m establishing new vetting measures to keep radical Islamic terrorists out of the United States of America. Don’t want them here,” Trump said earlier on Friday. Meanwhile, France and Germany are “concerned” over Trump’s move to restrict refugee arrivals.